Art Journals are a way for creative people to keep all their ideas in one place. Make one today to keep in your backpack for those moments of inspiration! Art Journaling is not a new concept. I have kept notebooks full of sketches and creative ideas for years, but this pretty painted journal concept has me really inspired! Creativity strikes at any given time in the day, and as a creative person you just never know when the urge will hit to create something. For this reason I carry an art journal with me everywhere I go. I have them in my purse, backpack, on my desk, bedside table, coffee table, book shelves even in the car. I love them even more if they have bright colors and pretty prints to inspire me! The blank journal is a canvas covered book with blank water color pages inside. I love the idea of creating in a keep sake book! The Art Journal came from Michael’s Crafts. Perfect surface for using these Americana Decor Stencils and paints. The compact size is ideal for toting in a back pack. This would be a fun project for kids to get them ready for back to school! This post is sponsored by Deco Art. Any opinions given are completely my own. For a complete list of Disclosure Rules see the disclosures page. •Place a small amount of each paint on the pallet. Add a bit of the Fabric Medium to each color and mix together with a plastic knife or pallet knife. •Practice your design on mixed media artist’s paper before painting on the journal. •Dab the brush in water, then in both red colors of paint. Stroke the brush left to right on the top 1/3 of the canvas. Add more paint and water as needed for a water color effect. •Using the same paint colors and technique as above, paint another strip in the lower 1/3 of the canvas. •Pickup the pink color paint with the same brush, without cleaning it. Working from the top of the red strip up to the top of the book, stroke the pink color from left to right. Dab the brush in water and more paint to blend the colors with the red. •Repeat the same technique with the pink paint in the center of the book, and on bottom portion of the book. Don’t forget to cover the edges and spine of the book. •Open the book up and lay it flat with the spine facing up and both covers facing toward you. Paint the back of the book to match the front. Let dry 10 minutes. •Practice the stenciling first on paper, planning the position of each medallion and word graphic. Dab the stencil brush in the paint, then on paper towel before using it on the paper for the best results. The brush should be rather dry when working with the stencils. •Pressing the stencil down firmly with one hand on to the cover of the book, stencil the medallions with the Pebble colored paint, then overlap the stencil pattern and repeat with the Natural Buff paint. Mix in a bit of white with each color as you work for variation. •Stencil back of the journal to match the front. Let dry completely. •Add the stenciled words to the front of the journal cover. Place the stencil on top of the book and stencil with navy blue paint and stencil brush. This is what the journal looked like before I added the stenciled words. You can add as many words as you like, I decided to keep it simple and use the ones that were the most meaningful to me. Thanks to Deco Art for sponsoring this post! Love creating? Here are some more posts to inspire you! 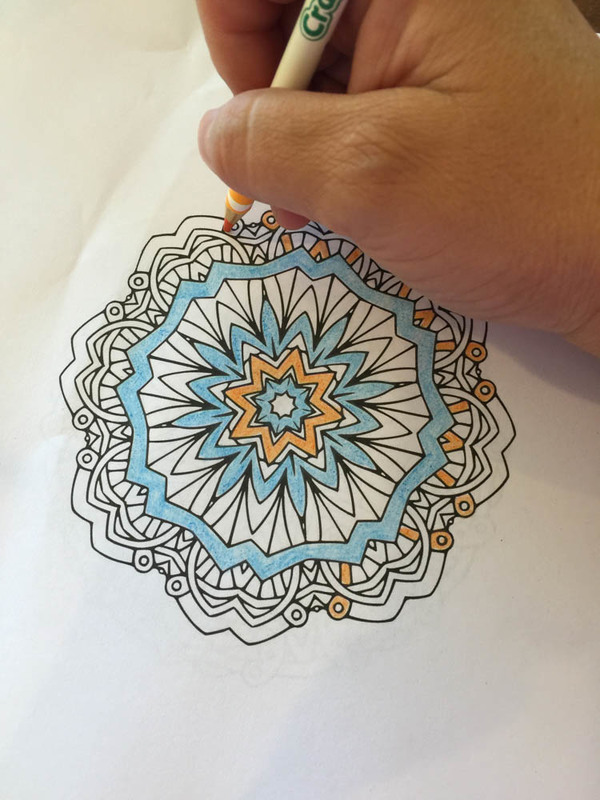 Subscribe and get my FREE MANDALA COLORING BOOK DOWNLOAD with 30 beautiful designs!